United win a well deserved three points in a particularly impressive first half at Tannadice. Robbie Neilson made no fewer than six changes in his starting eleven, following a busy day at Tannadice, as the transfer window closed on Thursday. Into the team came Nicky Clark, Calum Butcher, Mark Connolly, Peter Pawlett, Ian Harkes and captain for the day Mark Reynolds. Fraser Fyvie, Freddie Frans and Paul McMullan were joined on the bench by Sam Stanton, Aiden Nesbitt and Osman Sow in a clear statement of intent from the manager. Morton made one change from their goaless draw with Dunfermline last weekend, Greg Kiltie, on loan from Kilmarnock, replacing Charlie Telfer in the line up. The two previous games played between the sides had both ended up in one - one draws, with United needing an injury time equaliser on The Ton's last visit to Tannadice in September. If there were expectations that it would take a while for the newcomers to gel, no one had told men in tangerine as the game kicked of at a frenetic pace. As early as the third minute a driven Harkes cross was deflected for a corner. From the resultant kick Connolly rose well but his powerful header was well over. At the other end a Dallas effort was parried by Siegrist for a corner. United took a deserved lead after eight minutes, with Calum Butcher taking a lot of credit for his hard work to recover a ball at the edge of the area and play a neat one two with Pawlett. He then drove a powerful shot towards the far post, which was deflected by Pavol Safranko past McCrorie in the Morton goal. United took confidence from this and were attacking in waves at a beleaguered looking Morton defence. Callum Booth was effective down the left and a driven cross was scrambled clear by Kilday, with Clark waiting to pounce. There was a new aggressive approach to the midfield, with United picking up every loose ball. On eleven minutes Clark met a corner with a strong header, but the effort was too high. United looked like they had scored again on twenty minutes, when the impressive Pawlett won a header at the near post, brilliantly saved by McCrorie. Safranko's driven cross was nicked away from Clark by Buchanan as United threatened to run riot, Pawlett's driven shot was parried by the Morton keeper into the path of Clark, but he was just out of reach to poke the ball into the empty net. On thirty one minutes Pawlett scored United's deserved second goal. A neat pass by Clark left him one on one with McCrorie and he made no mistake sliding into the middle of the net under the stranded keeper. Morton thought they had grabbed a goal on forty minutes, but in a tight decision the referee's assistant flagged for offside after Dallas had poked the ball into the net from a couple of feet out. Kilday had to be replaced, failing to recover from an earlier knock, by Kerr Waddell in the heart of the Morton defence. 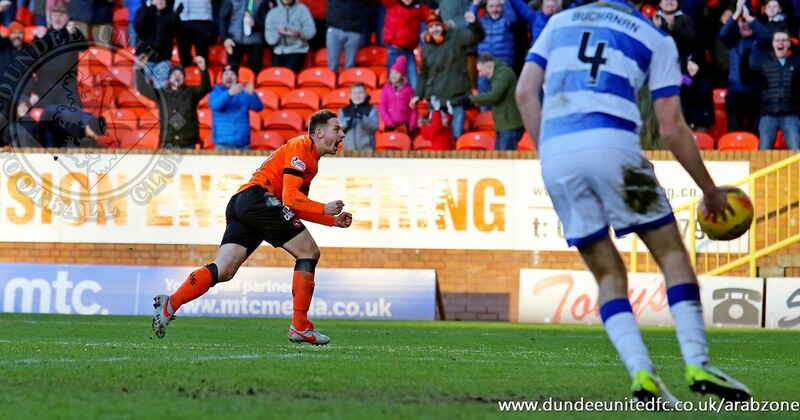 As the half closed Safranko, Clark and Pawlett all went close to adding to United's two goals as the Tannadice team ended the half in emphatic style. A corner count of ten to three emphasising United's dominance. United started the second half in the same way they ended the first forty five minutes, forcing three corners in as many minutes. Ian Harkes set up Smith after some tenacious tackling on the right hand side, however his shot on the turn was deflected away. The pace began slow as the game hit the hour mark, forcing Neilson to make changes with Fyvie and Nesbitt replacing the impressive Butcher and Cammy Smith. Fyvie's first impact on the game was to make a wayward pass to Kiltie and his cross to the front post was tapped in by Bob Mchugh on seventy three minutes. This gave Morton heart and they began to attack in numbers, but never serioulsy tested Siegrist in the United goal. United could have put the game to bed when Harkes had options on either side, but a poor pass to Nesbitt meant the chance was lost when it looked easier to play in Sow at the edge of the area. Osman Sow stretched his legs with ten minutes remaining, leaving the Morton defence in his wake, but his square ball was intercepted by Buchanan and the danger was cleared. After four minutes of injury time and to the delight of the Tannadice crowd Gavin Ross blowed for full time giving United a needed and deserved three points. Summary: United and there fans will have been delighted with the first forty five minutes. Every one of the new signings performed well and instantly United looked to have more grit and determination about their play. Whilst Morton put a little pressure on in the final fifteen minutes, United ran out deserved winners. Man of the match: Ian Harkes, in his first full match for United and his home debut the American midfielder showed great athleticism, accurate passing and aggression in the tackle when required. Pawlett and Butcher gave a glimpse of what they will offer United in the remaining games of the season too.